Yesterday a crow followed me home from the allotment, it flew low over my head and landed on the guttering of the bungalow, not five feet from my door, apparently to take a drink. I thought he would fly off as soon as I went to open door, but no, he watched me approach, cocked his head on the side as I said hello and stayed for a good few minutes as I chatted to him. I also have a pair of Magpie’s that use our garden as their playground, they chatter and dance about in the fence and the trees, stare in at the windows and watch me on occasion, they wind up the dogs and generally harass the smaller birds. I have noticed a distinct increase in corvids around my home over the past few years, particularly so since I worked on the artwork for Damh’s Mabinogi album of the 2nd Branch. Although the corvid family have been a prominent feature since the beginning of my druidic journey. I sat for hours in a cold, dank, Samhain camp field in the Vale of the White Horse, crows gathered close by to watch me as I meditated and waited for my bardic initiation ceremony in 1997, to this day they stay close. 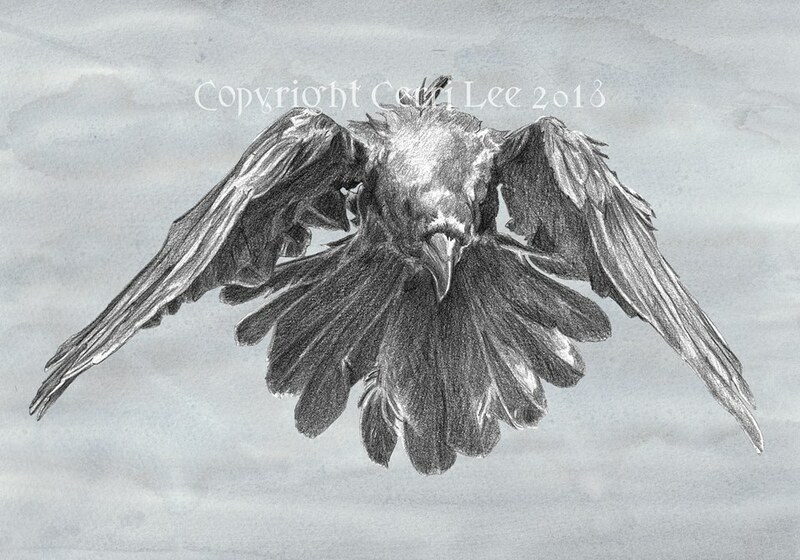 It feels a bit of a cliché to say my ‘power/totem animal’ is a corvid. Sad to say in my mind statements like that tend to conjure up the stereotypical image of a skinny, pale youth with dyed black hair, black clothing, a rather depressed outlook on life and a proclivity toward the ‘Dark’ goddesses. Sad creatures of the twilight, conflicted by their wish to keep the world at bay whilst at the same time needing to be noticed by dint of exuding their very own darkness. Not really my image style to be sure, though I have been know to plumb the depths of depression and indulge in my very own kind of darkness on more than one or two occasions. I may not have become an acolyte of any, perceived, ‘Dark’ goddess, I never have had the kind of face or figure to pull off goth imagery, though I do make good use of the rather dark sense of humour and array of inappropriate coping skills. However Corvids and all their fabulous aspects from myth and legend are a fundamental thread and presence in my spiritual life. Actually if it comes to it, I have a couple of animal archetypes that I would consider ‘Power animals”. They have been with me since my earliest memories of dreaming. One is the big cats, the other is horse. When I was a child I would dream of them both in equal measure. The main recurrent dream would be of a black panther, its penetrating eyes staring out of an incredibly beautiful face, sleek fur, the loping stride on huge padding feet, moving like a ghost through the world. It felt capable of anything, muscles ready to spring at a moments notice. I could feel the power, the movement, and the untamed nature of that cat so keenly in my dreaming. The horse dreams always came with a sense of freedom and sheer joy of being. Every time the dream consisted of two horses, a black stallion and a white mare, they galloped side by side at full tilt across a green landscape with nothing to hinder or restrain them. Again the feelings of connection came in a physical sense, the pounding of hooves on the hard ground, muscles straining to move faster and faster, the wind in mane and tail, neither running away nor running to anything, just running because they could. There have been some inexplicable personal events over the years that prove to me these animalistic dreams and sensations dive to deeper levels of experience and understanding. Sadly putting these primal experiences into a cohesive language that will relate to a western urban narrative is more than a little difficult without a surviving native system of engagement. We no longer have a cohesive body of symbolism and legends full of indigenous nuances that work as signposts. So much has been lost, so many of our animal stories and folk connections have been lost in the cultural drifts and overlapping of subsequent ideologies. We have to relearn our connections in order to apply the spiritual meanings to a modern life. Sadly we have had to borrow techniques of engagement from other cultures in order to learn how to relate to our own. I have, at various times, either invoked or spontaneously shape shifted into both a big cat and a crow. The spontaneous big cat event happened in a public parkland whilst watching a heard of deer, they all responded to my shift in energy. The crow happened whilst meditating in the Rollrights stone circle. I suddenly found myself looking down at the circle, and the top of my own head, through the eyes of a crow who was sat at the top of a large tree. Both of these spontaneous events were freaky to say the least, looking down at the top of your own head from the branches of a swaying tree, or, feeling ears flattening to the side of your head and an overwhelming desire to chase down prey, is somewhat disconcerting. For me the events were full of sensation, I could feel the movement of the tree swaying in the strong breeze, felt the lift and drop as the crow rode the swell. I have a pretty good imagination but these images and feelings were utterly strange and as physical as anything my human body or mind has experienced. I don’t question the validity of the experience, but how do I explain it, should I even try? What does the concept of an animal totem actually mean on a day to day basis? I know what it means to me, but I hear people say things like this or that animal is my power animal all the time and I wonder how does the concept of that animal actually manifest in other peoples lives. Is it just a feeling of an affinity with the idea of the animal or does it actually manifests in some tangible way? The corvid family and their association across the world’s cultures with the creation of humans, language, history, memory and thought all make perfect sense for the path I have taken as an adult. As apparent world creatures they are funny, playful, ruthless and smart, they can even speak like us if they choose, I admire them hugely. They make bargains and friendships, they give gifts to those who show kindness and remember those who show cruelty. They are consummate cleaners of the world’s gory mess particularly our own, they even tackle our rubbish bins like they cleaned up the war torn fields of history and legend. Have we ever thanked them for that? Well, no not really, like many creatures or people that do a difficult job we have tended rather to demonise them or be afraid of their talent for recycling the dead things we wish to forget, somewhat similar to the so called Dark Goddesses they are often associated with. They should get a medal for services rendered, it might have a legend engraved upon it saying something like, Cleaning up Human Mess Since the Year Dot. There is a tale I have heard, I don’t know its origin, it says that in a gathering of crows there are storytellers and if the tale is not told well the storyteller is mobbed and killed. Beware all those bards with a corvid as your totem as I think the story illustrates both sides of a corvid’s nature perfectly. In western cultures we lost the old tribal and familial associations with our indigenous animals, as in we are the people of the bear, snake or boar, down the ragged track of history. So how can we apply the idea of power animals and that kind of connectivity to the natural world today with any authenticity? What the heck is authenticity in this context anyway? What is the appropriate way of honouring the concept within a modern Pagan path without being labeled a cultural misappropriator? Is it enough that I feel a deep love and harmony with all aspects of the corvid family therefore, by association of ideas, they become my totem? Shouldn’t it be deeper than that, something more visceral, emotional, ineffable? I do feel a deep affinity with their story and I love them for the complicated creatures they are. I also have a feeling that they come closer now than they ever have and choose to show themselves in particular ways that feel significant. A variety of different corvids are never more than a stones throw away in larger than average numbers, but does that give me the right to call them my totem? Maybe I overthink these things, but it’s important to me to that I am neither glib nor arrogant in my perceived spiritual alignments. I want to be impeccable in my dealings with the universe and so I question everything, particularly my own motives. I think deep down I’m a bit of a zealot in my attitudes when it comes to striving for honesty on my path. I will continue to ponder on the idea of totems, but in my heart I feel that the corvids are my head totem. They sum up how I think and what I think about. The big cat is my inner nature, my core emotional driver, my passions and my outer expression. And the horses? Well, I believe they are a metaphor for the split nature of my spirit. The brooding dark stallion and the joyful white mare, when they are in harmony I fly on the wind and the earth moves beneath me. When they are at odds, then creativity and connection are harder to find. I don’t dream about the horses very often since I have become an adult, come to think of it I rarely dream about the big cat either anymore. But the Crows and the Ravens, the Magpies and the Jays are all there for me right now and that makes me feel honoured and happy. I always find your posts thought provoking – this one is no exception. I find – and at times probably me included – phrases tripping lightly off the tongue of some people without a thought for what it really means and how this is acted out in their day to day lives. Thank-you. We have to relearn our connexions and be part of a whole as being a whole in modern life, yes. Like a boat trip – waves high and low, but for sure waves. I enjoyed the reading of your inner experience.